bd’s mongolian grillÂ© is the world’s number one Create Your Own Stir-Fry restaurant concept where the guests choose their own ingredients from a great variety of meats, seafood, vegetables, salads, sauces and spices. The food is then prepared by master grillers on a 600Â° 7-foot grill. Since 1992, bd’s mongolian grillÂ© has been delivering a unique, interactive dining experience that sets them apart from the competition. bd’s mongolian grillÂ© has created a growing band of loyal customers that believe passionately about their ability to take charge of their own dining event. It’s their “You Rule the Experience” philosophy. Guests don’t just like bd’s, they love it! We are an awesome independent coffee shop located in Cedarville, Ohio. Our shop is a great place to study, to have meetings, to eat and of course to enjoy one of life’s simple pleasures — coffee at it’s finest! As the Beef’sÂ® story grew, so too did the menu. It was important to Jim that guests have variety (like the award-winning wings available in 12 signature sauces) as well as signature favorites with an Irish twist. Today, Beef ‘O’ Bradyâ€™sÂ® is one of the fastest growing restaurants in the country. Some call it the “Luck of the Irish.” Jim would call it a darn good dream that took a lot of hard work. 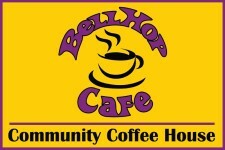 BellHOP Cafe is a Community Coffee House, Espresso Bar & neighborhood gathering place. We serve fresh roasted coffees, lattes, smoothies,. Breakfast & Lunch served all day. Pastries, Panini Sandwiches, & Soups. Free WiFi, Pool Table & Live Music!